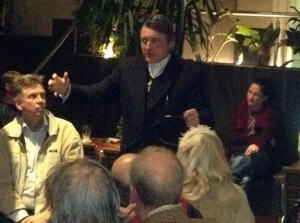 Father Dave back with you – a little weary but strong in spirit. I seem to have been spending all my time travelling and speaking since last we spoke. 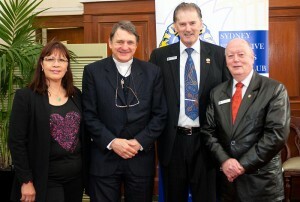 I spoke to a Lions Club gathering, hoping to raise more funds for our youth work. 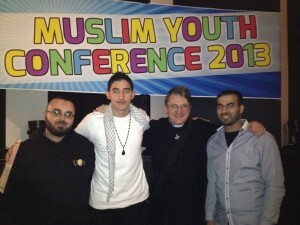 I had the privilege of being guest speaker at Sydney’s 2013 Muslim Youth Conference! I’m still trying to work out what made the ‘Muslim Women’s Association’ think I’d be a good speaker on the subject of issues facing Muslim youth, but I must say that it was a great privilege and I had a great time! 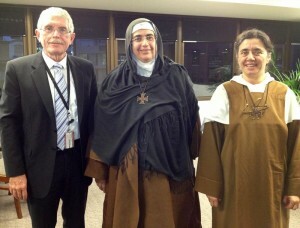 As to travelling, I’m still following dear Mother Agnes around! You’ll remember that not long ago I dragged Mother and Sister around Canberra. We got back and went one step further up the ladder of greatness and met with Bishop Rob! 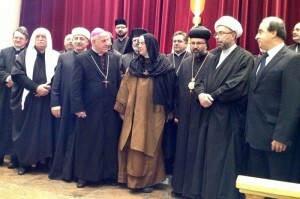 Then, before Mother Agnes left our fair state, all the churches shared with her in a wonderful evening of prayer for Syria at the Syrian Orthodox Cathedral in Sydney. Right now I’m en route to meet up with Mother again – this time in Kuala Lumper! Indeed, I’m starting this missive at an altitude of 11582 metres according to my flight information (and I thought they always measured these things in feet )! Within a few hours of landing we are scheduled to meet with members of the Malaysian Department of Foreign Affairs. Our subject, of course, will be Syria. Our host in Malaysia is the great human-rights activist, Dr Chandra Muzaffar. I first had the privilege of meeting Dr Muzaffar in the late 80’s in his home in Penang. I had read about his exploits – how he had worked tirelessly to defend the rights of minorities in Malaysia, especially Christians. That was the first time I had heard of a Muslim community leader putting himself on the line for Christians. And then I heard how he’d been imprisoned by the government for his efforts – an act that created such a stir worldwide and generated so many protests (including many from prominent church leaders) that the Malaysian government was force to release him! It seems that this year I am getting to meet all my heroes!. I had the privilege of travelling to Syria with the great peace-maker and Nobel Laureate, Mairead Maguire, and now I’ve been invited to Malaysia by another champion of human rights! And of course it didn’t surprise me when Dr Muzaffar told me that Mairead was on the board of his human-rights organisation – JUST (The Campaign for a Just World). God has been extremely gracious to me of late and I do not take it for granted. 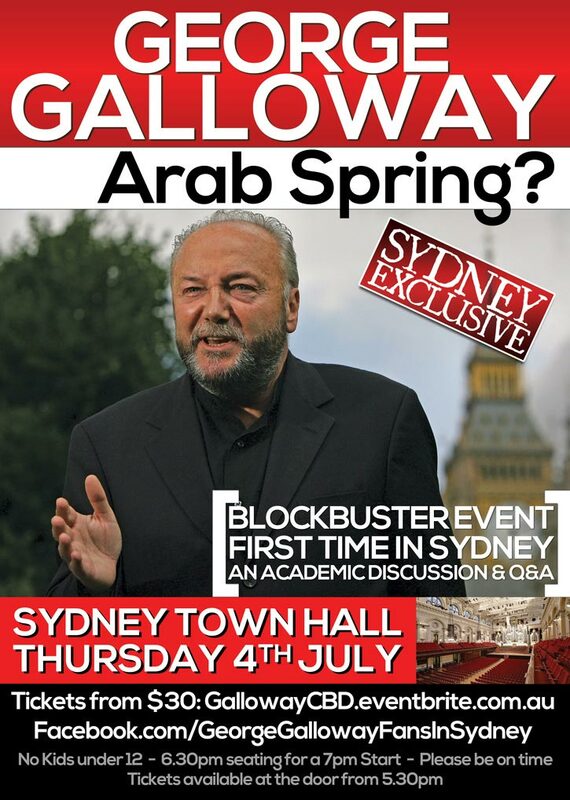 Just when I thought I was running out of heroes to meet, that outspoken and wonderfully offensive Scotsman, George Galloway, arrives in Sydney! If you don’t know George, he’s a British politician and a passionate human-rights activist, particularly well-known for his Palestinian advocacy. How did he come to be in Sydney? Well … it’s a long story, but my friend Mohammed Naqi gets the credit for organising both his trip and his appearances! There are two public gatherings and only one that has not been sold out. 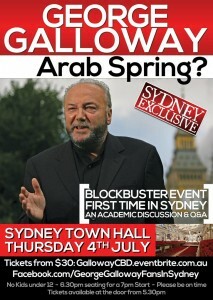 It’s at the Sydney Town Hall this Thursday evening. Click here to get the details on Facebook or here to download the flyer. The event is not free because Mohammed needs to cover his costs for the hire of the Town Hall (which doesn’t come cheaply). Even so, this is a great opportunity and not one to be missed. I will certainly be there (God willing) and hope to see you there too. 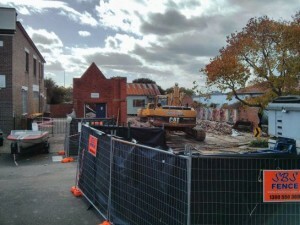 No, we haven’t rebuilt our Youth and Community Centre yet after the arson attack in March that completely destroyed it, though we have now levelled the site and have submitted our ideas to the architects. While we wait for our new centre to be constructed, we are teaming up with our new best-friends – the Salvation Army Corps of Dulwich Hill – to open a new Youth Centre in our area, based on their premises! It’s a true joint venture. The Salvo’s are providing their wonderful space and are also contributing a youth worker. We are contributing more team members and lots of equipment, including a new boxing ring! I guess the Salvos are also counting on us to supply a truck-load of kids, and I trust that we won’t disappoint! At any rate, we have scheduled our grand opening for Sunday July 28. We’ll probably start with a lunch-time BBQ and continue till early evening. I know that some of our Koori friends have expressed enthusiasm with regards to providing a band. My idea was to celebrate the opening by having a last-man-standing bout with Fighting Father Caine! Either way, we’ll hopefully also have clowns and jumping castles and sticky food and lots of other great party stuff! It will be a great opportunity to put the ashes of the past behind us as we forge ahead with new initiatives of service to the young people of our region! I mentioned last week that our beloved Binacrombi caretaker, Geoff, is leaving for New Zealand and that we are looking for teams of people to run weekends down there. I’ve had a handful of people express interest, but now I really need those of you who are interested to get down there before the end of this month (when Geoff leaves) and get trained in how to run the site! It’s not easy! We have our own eco-system at Binacrombi. We are not connected to the power-grid, the gas-grid or to any mainline water or sewerage system. You need to know how our generators, gas system and water-piping system works, and you can only really learn through hands-on experience. So if you’re keen please book in over the next few weeks and let’s make Binacrombi the greatest adventure camp for young people in the Southern hemisphere! OK, I’m not selling all of them, but with Fighting Father Jim now gone (see last week’s post) it’s going to be impossible to maintain so many of my traditional sites. I have at least three ‘mininets’ of sites that I’m willing to part with. All are useful and informative sites that can also generate a significant income through Adsense ads etc. These site networks are currently being under-utilised as I just don’t have time to maintain and develop them any more. They cover topics such as child custody and drug addiction. Interested? Send me an email and we’ll work something out. OK. It’s high-time I got back to more spiritual matters. Last week we had the privilege of having Mother Agnes join us for worship at Holy Trinity, Dulwich Hill, and it was a wonderful service! 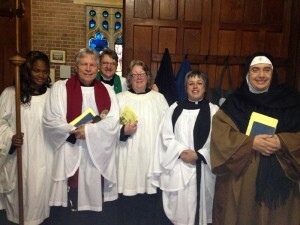 Here’s a pic of our liturgical team just before the start of the service. Some said that it was the greatest service they had experienced at Holy Trinity. Mother Agnes, for her part, said that it had ‘all the grandeur of the Byzantine liturgy’. I’m sorry I can’t give you a recording of the whole service but I have got Mother Agnes’ sermon for you. Enjoy! OK guys. That’s it for me this week. As expected I’m now in Malaysia. I’ve just met with the Under Secretary of the Ministry of Foreign Affairs and am soon to head off for dinner with dear Dr Muzzafer! So I’ll hold off on the details of all that till next week. This entry was posted in Monday Missive and tagged binacrombi, george galloway, Good Word, mother agnes, mussalaha, Sydney, syria, syrian civil war by Father Dave. Bookmark the permalink.